Continuous Experimentation fills a major gap in the lean and agile literature available so far: social innovation. Leading with a theory of society and economics as an extended phenotype of our genetic code – one that is far from deterministic – Continuous Experimentation argues that socioeconomic constructs are a scaling fractal of the human genome and draws conclusions about postmodern capitalism and culture. It is a common recommendation – across Scrum, Kanban, Scaled Agile Framework, XP and other Agile methodologies – that enterprise silos need to be reorganized for a Culture of Innovation to emerge. We miss the irony that these topics were alluded to (however poorly) by Freud and Marx, as well as the best philosophers who “loosely-coupled” their theories: Deleuze and Gauttari. So far, these recommendations follow the same ineffective architectural patterns that silos caused in the first place – development training, leadership training, product training; books on architecture, DevOps, Lean Startup principles. All of this information is critically important, but remains job-function specific. With contemporary insights taken from disparate research disciplines, smashed against real-world experiences “in the trenches” Andrew Keener’s Continuous Experimentation builds a comprehensive, pragmatic view of socioeconomic transformation. For the ScrumMaster, Agile Coach, or Digital Consultant, Continuous Experimentation provides an in-depth exploration of the root-cause of enterprises that refuse to innovate. For the Lean Startup founder looking to scale, Continuous Experimentation provides a cohesive view of the impact of organization structure and communication on innovation. For the enterprise Lean-Agile Adopter, Continuous Experimentation explores the pragmatic questions of what can change and what will not change, even after an agile transformation is complete. For the Knowledge Worker, Continuous Experimentation is a critical analysis of the sociopolitical constraints of Postmodernity, a digital society progressing toward singularity, and the power and necessity of every individual’s leadership imperative. Introduces the fundamental problem of leading innovation as a problem of economics and evolution. Why do we care about innovation? Postmodern American capitalism has accelerated the invention, commercialization, and adoption of new technology products. Has anything more central to our daily lives really changed? Innovation is in our DNA, but the postmodern market for technology has driven a capitalist obsession with innovation. Market information is imperfect, which is made worse by the complexity of advanced technology. The ability to lead a postmodern organization is a problem of competitive maneuver and the acquisition, and manipulation, of information. Orients the reader against the problem of postmodern socioeconomic innovation, we will define the system as a scaling construct and look at examples – organic and artificial – of scaling into higher levels of complexity and adaptiveness. Draws initial conclusions about the limitations of scaling, responsiveness, and adaptation for the leader. Explores the complex systems of the mammalian body, especially the human species, as a template for liberating the knowledge worker and laborer without an upheaval of capitalist economics. Looks at the preservation of self-organizing Organs of Power within an overall re-territorializing body-system. Draws conclusions about rhythm and messages as a coordinating mechanism in addition to visualization of digital labor. Concludes the necessity of socioeconomic freedom of the individual as an essential element of innovation at scale. Now that we see how organic systems scale, we explore our place as actors in a long-run organic and socioeconomic “experiment” that optimizes itself based on survival. Links evolutionary emergence to social power dynamics and the development of information on increasingly long time-scales. Lays the groundwork for the minimum viable postmodern economy as a complex adaptive system. Continues to build on the role of emergence in complex adaptive systems and the interlinking problem of socioeconomic organisms as a self-aware information-generating species. 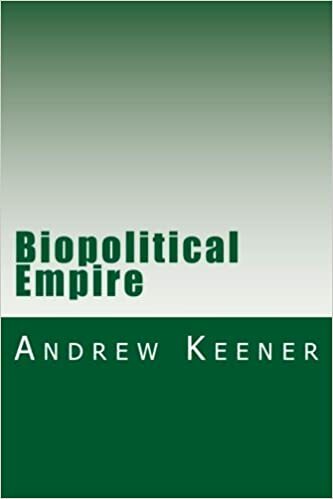 Draws parallels between successful biological systems and three primary socioeconomic constructs – the body politic, the body incorporated, and the ideological institution. Considers systemic problems that have not been solved by post-Keynesian capitalism for the laborer, including the new form of alienation suffered by the postmodern knowledge-worker. Draws conclusions about leading an organization this is adaptive enough for long-run viability. 6.1 WHAT IS AN ORGANISM? If experimentation, adaptation, and the development of complexity are already within our facticity, how should we apply that underpinnings of human experience to the innovation of socioeconomic progress? Explores the leader’s task in creating a re-territorialized social construct for economic information activity. Looks at role of attractor-tasks and compares it against emergence as two forms of leadership. Looks at the social implications within existing institutions and organizations. Applies a critical comparison of parliamentary versus constitutional democracy and their reverberations throughout socioeconomic constructs. Tackles the problem of adversarial ideological systems, how they compete, and “free” market of ideas. Connects pragmatist philosophy of truth to the economics of information products and bundling. Dives into the interconnection of signals and signification, closing the gap between biological systems and information systems. Introduces the concept of first-signifier disadvantage and the sociopolitical strength of tension and instantiated hypotheses. Makes a final dismissal of homeostasis, and counters the fetishism of capital, truth, or the genome. Elaborates the scaling tensions that raise structures to fight against The War Machine, a phantom representation of socioeconomic unravelling. Develops a framework for operationalizing strategy without the dysfunctional outcomes of The Body Without Organs. Links the forms of communication in the human body to the socioeconomic body-system. Draws conclusions about the internal and external signals, messages, and signification necessary to lead an organization to develop a culture of innovation. Although the unmanaged system will develop its own Emergent Prestige economy, there are three main patterns we see in the process of re-territorialization and structuring – arborescent, rhizomatic, or viral. These patterns are likely to intermingle, of course, and continuously exchange outside the economy as well. Thus, the multiplicity of value within and outside the institution is the source of its power. Every player has uncollapsed probability, outside the construct, to pull into The Moment for signification-recording. The system is more than the sum of its parts precisely because it borrows energy and tension from other systems, sharing the same “host” – the individual socioeconomic actor. We will see that Emergent Prestige needs a mix of arborescent, rhizomatic, and viral exchange to explain the organic scaling and innovation, and the dangerous folly of forcing the system into only one structure during identity-signification. Macroeconomic scaling patterns must use all three connective mechanisms to embed ever-faster control cycles within increasingly long-run viable economic cycles. Arborescence is where we began our discussion of Organic Leadership – the Oak tree. Arborescent structures rely on hierarchical multi-fractal scaling with branching. Rhizomatic behavior is also organic, but it is both node-generating and node-linking, it spans ever-horizontal. Rhizomes send their tendrils outward, mapping horizontally until a point of opportunism allows a springing upward. Cutting them and replanting them allows multiple plants to emerge. Virality is the origin of jump discontinuity, as rhizomatic value jumps across nodes or up and down arborescent hierarchy. Arborescence is an attractive model for top-down identity-signification due to its simplicity. Controlling a system into conformity with an arborescent structure, however, creates limitations for innovation. Tree-like organs of power are ever-emerging but tactical at all levels, splitting and separating to find more energy or resources, opportunistically moving apart – upward, downward, and onward. It is the classical family system mapping and the oldest power structure of our socioeconomic constructs, within religion, the military, kingdoms, guilds, and corporations. The trunk of such an isolated organ of power is a rigid bottleneck, a slowly growing but overwhelmingly rigid chokehold on the encapsulation and transfer of information. The main weakness of identity-signification that relies exclusively on arborescence lies in the concentrated effort to resolve all tension with branching. Emergent Prestige in arborescent organization is the climb to ever more hierarchy, whether King, President, Pope, or otherwise. It may be charted out for everyone to see and announced widely when a change occurs, or it may be implied through access to resources, power, or the corner office. Even in presumably “flat” organizations, the owner often exercises unlimited control to appropriate otherwise “open” spaces. Rhizomatic behavior is network-building. Power follows pack dynamics, from the aristocracy to street gangs. We see odd similarities in the node-based organs of power created by such prestige networks. The spreading notoriety-power of tribal prestige within ideological systems is rhizomatic. There is still opportunism, to be sure – the rhizome is always looking for the right opportunity to shoot upward, breaking away from the network into the sunlight. Importantly, Rhizomatic networks can survive schisms in ways Arborescent networks never can. It is insufficient to map out the combination of arborescent and rhizomatic networking that is required for the development of territorialization and identity-signification. Virality is the source of innovation. Virality behavior interlinks planes of observation, shortcuts value across nodes, from the exchange cycle of plant pollination to the horizontal gene transfer that swaps genetic signals between alien information systems. This is the real innovation we collapse when we begin optimizing per branch rather than cultivating the ecosystem of the forest. A planned economy, especially an Emergent Prestige network, can never reproduce the full complexity or adaptive behavior of Organic Leadership.